Circle LUX 9 renders the body as raw material that can attain different qualities, textures and properties. It exhibits the body as a construction that we can fit into and burst but also as a surface that we can project upon. It strives towards a shifting subject, a constant dissolving of cultural and social codes at the same time as it playfully merges and utilizes its different expressions without ever wanting to belong to a specific identity. Circle LUX 9 is a perpetual transformation of the body, the space and the relation created in between. Passing through different spaces, evoking intimacy and imagination it moves between landscape and display. It’s s an intensification of the presence which leaves traces and anticipates the future in an ongoing loop. Always on the move, in a constant becoming. Circle LUX 9 proposes the concept of a “magic circle” as a place where temporary worlds within the ordinary world can occur. Linda Blomqvist born in Stockholm, 1985 is a choreographer and dancer currently based between Brussels and Stockholm. Her work aims to expand the notion of choreography with a focus on alternative modes of production, process and practice from a speculative viewpoint taking various forms and expressions. Linda studied dance at The Royal Swedish Ballet School 1995-2004 and at P.A.R.T.S 2008-2010. She has been active as a performer in various productions and is touring extensively internationally. In 2012 she joined Rosas where she performed in “Drumming”, “Rosas Danst Rosas” and “Golden Hours (As you Like it)”. Since 2013 she has been working and touring with Mårten Spångberg performing in “The Nature FR”, “Epic”, “La Substance – but in English”, “The Planet” and “Natten”. Besides this she’s also been performing with Alexandra Pirici, Cristina Rizzo, TG Stan and Cristina Caprioli to name a few. In 2012 she got invited to participate in the cross-cultural European network TRYANGLE in Montemor where she presented “The Power of Horror”. Her works “Lucha Libre”, “Circle Lux 9” and “Cosmos The Beach” have been presented at MDT- Stockholm, Small Projects- Tromsö, PAF Performing Arts Forum- St Erme, RPS Rosas Performance Space- Brussels, Rimi Scenekunst- Stavanger and at ImpulsTanz- Vienna. 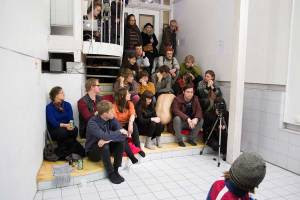 Linda initiated Indigo Dance together with Emma Daniel, Anna Gaiotti and Adriano Wilfert Jensen upon an invitation to curate the “Dance week” at PAF during the Summer University 2014. Indigo Dance is a platform for artists with manifestations such as a study circles, festival, tumblr and publication (Indigo dance magazine) These various manifestations aim to find alternative modes of knowledge production and exchange implying peers teaching peers in the name of curiosity, experimentation and realization of concepts. It holds a space which is supportive and allowing for the practitioners in the field striving to build a discursive landscape which questions who has a voice and the right to speak. Choreography and performance: Linda Blomqvist. Supported by: The Swedish Arts Grants Committee. Produced in collaboration with MDT, CCAP, PAF and Rosas.